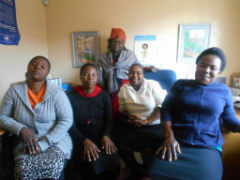 Masoyi Home Based Care (MHBC) is the response of Florence Mbokazi (middle back) and her team to the large numbers of people in the community who are affected by HIV / AIDS. 21 volunteers visit house bound patients to encourage, assist and care for them. Every day of the year the volunteers go into the community braving the scorching sun and rainy days to reach their clients. This committed approach is done so that people's situations are monitored, making sure that they are adhering to the doctors' prescriptions from the various community clinics and hospitals they are working with. They have the understanding and experience to ensure every person is complying with the details of their prescription. When they go out to the community the volunteers ensure they have food parcels in the car for emergency cases, predominantly for those who are taking medication but who have no source of income to enable them to purchase food for themselves and their families. Most of the clients are older people, most with children and grandchildren and maybe some of their extended family members staying with them and relying on them for a support. In addition the volunteers follow-up on appointments and counselling referrals to relevant organisations, give emotional and spiritual support, facilitate the development of small gardens and small income generating activities, assist with HIV counselling and testing, undertake door to door campaigns with information regarding HIV and TB, refer people who have tested HIV positive or have signs and symptoms of TB to the primary health centres, and facilitate open and closed support groups in the community and health centres. 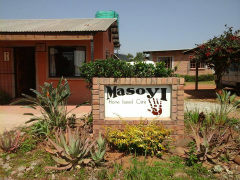 Masoyi Home Based Care (MHBC) began as an urgent measure to respond to the effects of HIV/AIDS in 1997. There was a lack of basic knowledge of the pandemic and this resulted in many untimely deaths, which in turn led to an increase in orphaned and vulnerable children in the community. It came into existence on the back of some people being concerned about the number of house bound HIV+ people in the community not being cared for. As time went along they also started more prevention type programmes. Bright Hope World first heard about Florence and MHBC in 2013 when a previous BHW partner, Mutita Kashimoto, was studying in White River and volunteered with them. BHW's Field Director visited in August 2014 and again in July 2015 and in September 2015 a decision was made to commence partnering with MHBC. There are approximately 400 patients who are the direct beneficiaries of this partnership. These people are referred to Masoyi by community leaders and others. The majority of them are house bound due to the nature and severity of their illness and often the shame and stigma associated with this. The key leaders are very passionate about this community. They are operating out of compassion and the love of Christ. They have good structures in place, great programs and processes. They are good people with good hearts. The people they minister too are as poor as it is possible to imagine. It is difficult to work with many as their world view is so distorted they cannot even help themselves. Florence Mbokazi was born in June 1956 at Pen Drin. She attended Brondal Primary School and during the school holidays and weekends she worked at the Brondal Clinic. She attended secondary school as an adult student after getting married and giving birth to all her children, Lindiwe (born in 1975), Eurica (born in 1987) and Thando (born in 1991). After completing High School in 1995 she commenced working in a clothing store. In 1997 she resigned from this job and started to work at Masoyi Home Based Care as a volunteer looking after sick people and children. In 1999 she started an orphan programme as the coordinator. In 2001 she became the coordinator of Masoyi Home Based Care Organization and she has been a director of the organization since then. In 2002 she attended White River College and gained qualifications in Human Resource Management, personal communication and computers. In 2007 she attended Damelin College for computer and project management fundamentals and then in 2010 she undertook an advanced management course there. In 2014 she attended Health and Welfare Section Education and Training Authority doing a Learner Achievement Transcript and then in 2015 she did Business Management and Finance. 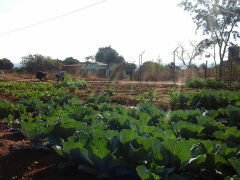 Florence currently resides at Swalala Trust, one of the villages in the Masoyi community. Patricia Sesi Mgiba is the leader of the Home Based Care team. She has qualifications in Enrolled Nursing Auxiliary, HIV counselling and testing and male medical circumcision training and has previously worked in two hospitals in South Africa. To give emotional, physical and spiritual support to the most vulnerable patients in the community, through home visits, support groups and HIV and TB awareness and referrals. Their established strategy is to visit people in the community who are house bound due to their illnesses. 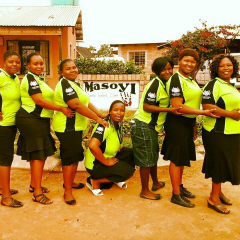 Local volunteers are taken into the programme and trained to become home based care workers and community nurses. The annual budget here is US$12,100 and this helps fund the care kits (medication, gloves, etc), transportation, support groups and a volunteer stipend. Over the years MHBC has seen a reduction in people living with tuberculosis as they are able to do TB screening. They have also been able to ensure people take their HIV prescribed medications which has resulted in less deaths as a result of HIV and that has reduced the issue of having many orphans and vulnerable children losing their parents and guardians due to HIV and other chronic diseases. Since starting the HIV testing and counselling program they now have a large number of people who are getting tested and knowing their HIV status which has played a role in terms of having thousands of people living a healthy lifestyle. Because they also hold community events where they bring awareness to the community about HIV and other STI's people now know that they have to protect themselves and other people around them.